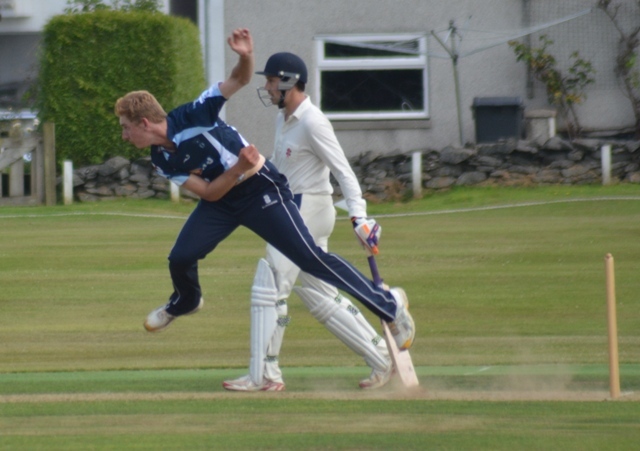 Seventeen year old Dumfries opening bowler Niall Alexander has been selected for Scotland U19s for the ICC U19 World Cup Qualification tournament to be played in Holland next week. With only one European side now going through to the finals in 2014 in the United Arab Emirates the side will need to overcome the likes of Ireland and the Netherlands in the six team round-robin. Alexander has been warming up this week for Scotland u17s against Ireland. He follows the Dumfries club’s Tom McBride who played in the previous U19 World Cup in Australia last year. On Saturday APD Dumfries lost to Clydesdale at Nunholm by four wickets as the CSL Western Premier League resumed. Dumfries posted a score of 153 all out with the Walker and Sharp Dumfries Man of the Match, Chris Bellwood, hitting 43 and Marcus Richardson 38. Scotland bowlers, Sharif and Haq, took four and two wickets respectively. Clydesdale reached the target for the loss of six wickets. Spinner Scott Beveridge took four wickets and Drew Dawson two with Farid finishing on 52 not out. On Saturday Dumfries next play Stirling at home in the league. Also on Saturday Eco-Genics Nunholm beat Clydesdale seconds away at Titwood by forty runs in the Western Premier Reserve league. Nunholm hit an imposing 288 for the loss of six wickets. Davie Davidson top scored with 78 and Goodin, Brockwell and youngster Dean Brotherston all scored in the forties. The Thomson and Jardine Nunholm Man of the Match, Jerry Goodin, took four wickets as Titwood fell short on 248 all out. Scott Beveridge, Chris Bellwood and Peter Lojszczyk played the first match in the inaugural Euro Challenge Series between Scottish and Dutch Pro teams at Ayr last week. Beveridge was not out helping the Border Reivers over the line in their four wicket win over the Holland Seafarers with a forty six run sixth wicket partnership with century maker MacLeod chasing 235 for 8. He and Lojszczyk also took a wicket apiece. Holiday Junior Cricket: A 1-day summer camp takes place at Dumfries Sports Club, Nunholm on Thu 1 Aug, 10-3pm (ages 7-14), boys and girls, and is suitable for beginners, cost £10 members, £12 non-members. Contact the Club on 07799 856094, dumfriescricketclub@gmail.com , or see www.dumfriescricketclub.co.uk, @dumfriescricket. Club junior coaching sessions continue at Nunholm each Monday through the holidays from 6:15-8.